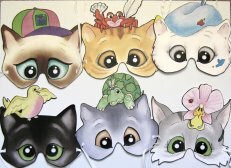 Here is a set is six paperboard cat masks. These masks have fabric ties. Each mask is approximately 8" wide x 8 1/4" high.